As expected GTA IV : PC version is now released, and as usual untouched CLONE-DVD images of the original game got leaked on BitTorrent portals, thousands of users are now in the leeching queue to download the game, However, no working crack or activation hack seem to exist now for using the pirated copies of the game. Released as two massively sized DVD's totaling 13.85 GB, GTA IV for PC is protected by SecuROM DRM. According to reports on various forums, users downloading the leaked DVD images from Torrent portals and file-sharing networks like Rapidshare and Megaupload are able to install the game but unable to activate online, and play without a working crack or activation hack as of now, cracker groups like RELOADED have cracked SecuROM protection earlier and GTA IV PC game downloaders are waiting for cracker groups to release cracks and NO DVD hacks for one of the most anticipated PC games of all time, fake cracks and online activation hacks have also started appearing on file-sharing network likes Rapidshare with intention of collecting Rapidshare Points and spreading malware. Wow, thanks I was wiating for this, Razor crack is out guys downlaod it. ahh where is the download link for the torrent? Why would he give out an illegal link on his site, lol? I will probably download this myself, just saying.... this isnt the place to get the torrent. But hey, I have seen weirder things in my lifetime, like a cooking site giving out adult content. lol. I Love this game, its massive so I guess GTA IV PC game Rips must be coming soon once it is fully owned by crackers. It seems that Rockstart made an really excelent job at protecting this game.. there aint no working cracks or anything even today (release day) So i guess you guys have to buy the real game ;) just deal with it. SecuROM is already cracked by groups like RELOADED and Razor sooner or later a crack for GTA IV will come, add to that I am pretty sure a RIP version is also coming. 1. Visit a local game store. 7. Play and Enjoy the game. the company seems to think that the people would buy every pile of shIIt they throw at us? - the game DOES NOT run on most of ati 3000/4000 cards! 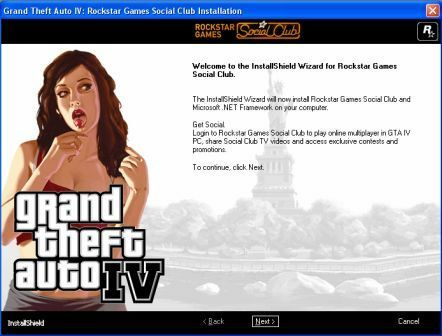 after the half hour installation you have to install »Rockstar Social Club« and Microsofts »Games for Windows Live« and create some online accounts for them!? and then you have to update gta live AND activate it online. how about just copying the files into a folder and just press start?? so i would never buy this and wait for a consumerFRIENDLY product that the releasegroup will throw on the market. i just get a quality release - the cracked version. and you have to install microsoft .NET framework!?? dont you have your own development surrounding? bunch of morons! seems you have a contract with nvidia also. or you were afraid to loose some money when not releasing a halfway working game at the announced date? • Social Club must be aktivated to PLAY it! • Windows-Live must be activated to SAVE it!! • the forth time it starts..
• if Process Explorer is running, securom prevents game from starting!! • one out of 5 times securom doesnt start the game because of emulation error! • one out of 5 times the dvd is not recognized despite of activation! the loading times are extremely long, various clips at the start you cannot escape! the VRAM of the graphic card limits the Grafikdetails! FSAA isis NOT possible & fast camera movements are stumbling! if not them, who else deserves a crack?? Here's the Razor crack and another that work as far as I know. I havent tried them yet, but i thought that I would share the wealth. how to download gta iv.you can send to my yahoo mail.